Two major market crashes, numerous financial and accounting scandals, growth in private equity and hedge funds, Sarbanes Oxley and related regulations, and international developments changed security analysis and business valuation substantially over the last fourteen years. These events necessitated a second edition of this modern classic, praised earlier by Barron's as a "welcome successor to Graham and Dodd" and used in the global CFA exam. This authoritative book shows the rational, rigorous analysis is still the most successful way to evaluate securities. It picks up where Graham and Dodd's bestselling Security Analysis - for decades considered the definitive word on the subject - leaves off. Providing a practical viewpoint, Security Analysis on Wall Street shows how the values of common stock are really determined in today's marketplace. 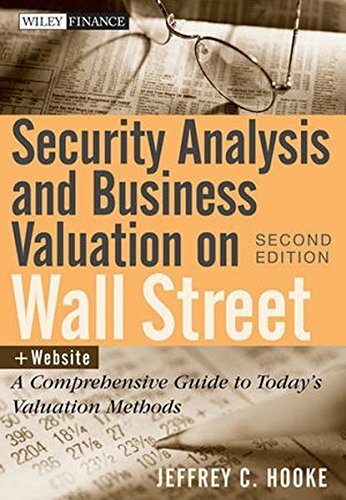 Incorporating dozens of real-world examples, and spotlighting many special analysis cases - including cash flow stocks, unusual industries and distressed securities - this comprehensive resources delivers all the answers to your questions about security analysis and corporate valuation on Wall Street. The Second Edition of Security Analysis on Wall Street examines how mutual funds, private equity funds, hedge funds, institutional money managers, investment banks, business appraisers, and corporate acquirers perform their craft of security analysis and business valuation in today's highly charged environment. Completely updated to reflect the latest methodologies, this reliable resource represents the most comprehensive book written by someone who has actually worked as an investment banker, private equity executive, and international institutional investor. Security analysis and business valuation are core financial disciplines for Wall Streeters, corporate acquirers, and international investors. The Second Edition of Security Analysis on Wall Street is an important book for anyone who needs a solid grounding in these critical finance topics.